Though he is traditionally credited as the author of the Iliad and the Odyssey, there is no reliable information about an actual, historical Homer. In antiquity, he was an honored figure, despite little being known about his life or even his era; he was credited then with several other shorter works in addition to the two epics. Current scholarship tends to view the poems as the work of many hands over many years, with differing opinions on the role and importance of any single figure in their creation or promulgation. Richmond Lattimore (1906–1984) was a poet, translator, and longtime professor of Greek at Bryn Mawr College. Richard Martin is the Antony and Isabelle Raubitschek Professor in Classics at Stanford University. "Both lucid and learned, Lattimore writes with a certain grace, capturing the combination of nobility and speed which over 100 years ago Matthew Arnold famously heard in Homer’s work. . . . Read Richmond Lattimore's translation for the epic scale and narrative of Homer's poem." 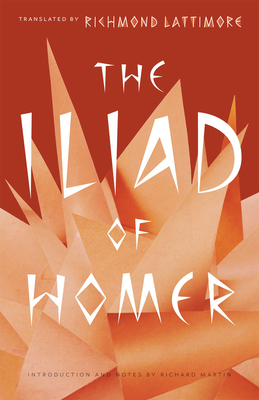 "Martin's introduction surpasses all rivals. . . . Lattimore's Iliad is best for those who want to feel the epic from the loins up, its rush, its reprieves, and its overwhelming rage."